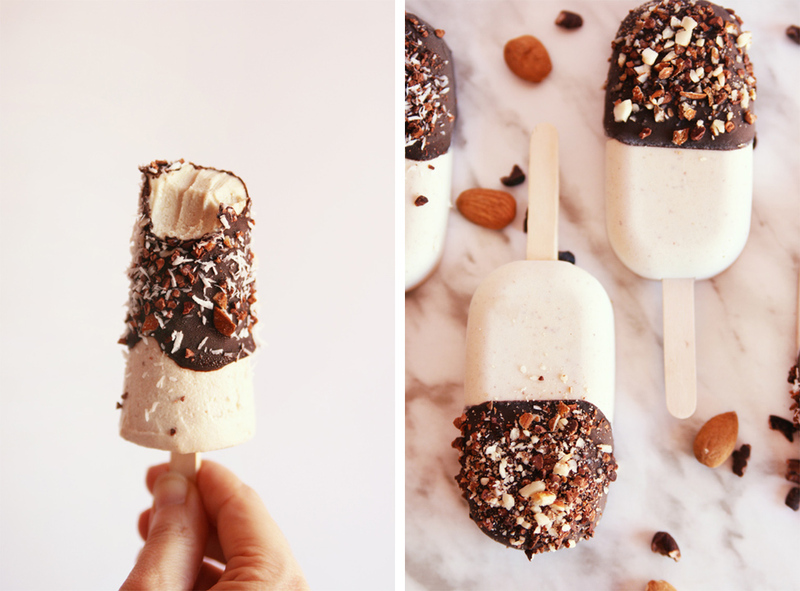 Have you noticed that your Instagram feed is full of popsicle recipes this week?! 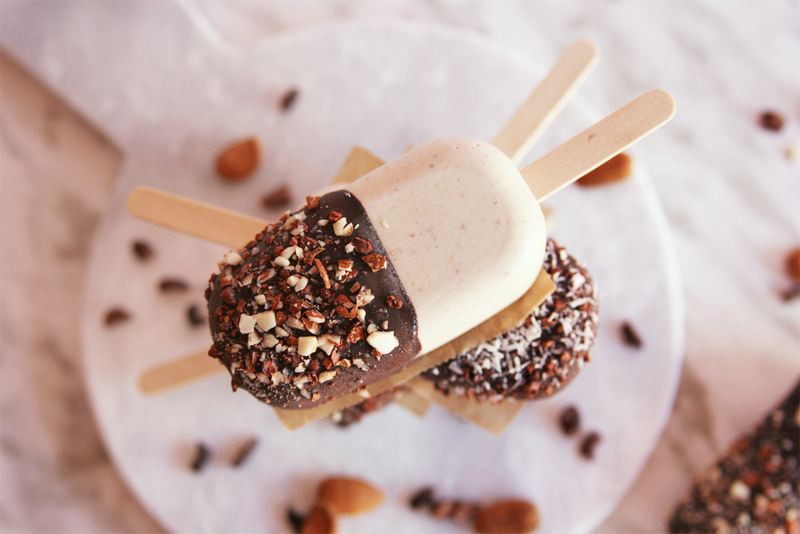 Well, I could say that I finally jumped on the popsicle bandwagon (#popsicleweek) but actually I made this recipe last week, though I didn't have time to share it with all of you until today. 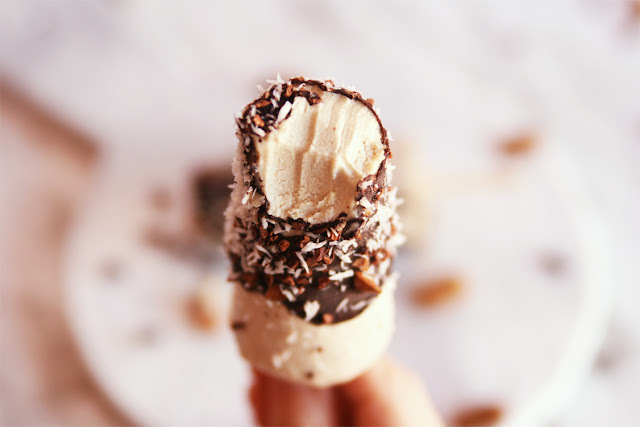 Better late than never they say, right?...plus there's always time to enjoy a creamy and delicious pop, especially now that we're well into summer and yours truly is madly addicted to ice creams, pops, frozen smoothies and watermelon gazpacho. Even though summer gives me low blood pressure and some days I feel a bit weak and sleepy it is still my favorite season. Don't even get me started about cute floral summer dresses and sandals...gosh, I love them so much! 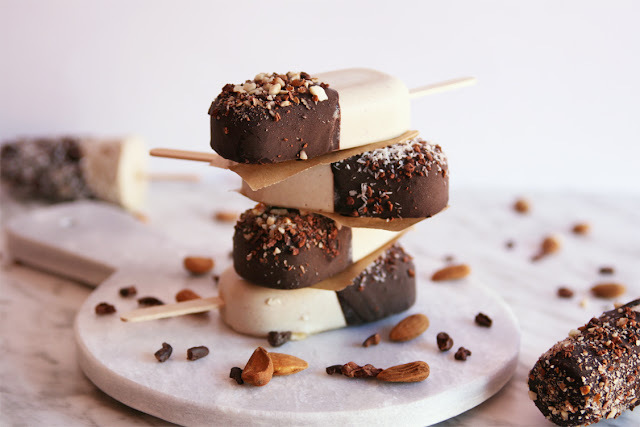 So back to the recipe, these popsicles are really really good, deliciously creamy with a nice combo of cashews, almond butter and vanilla, of course! 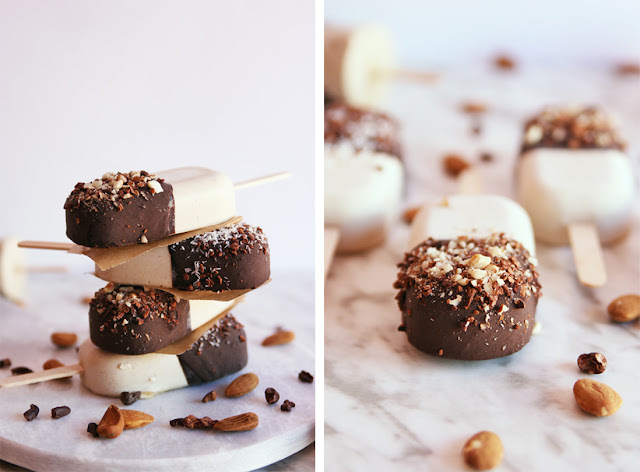 They are easy to make and will give you a good dose of energy thanks to its natural ingredients. 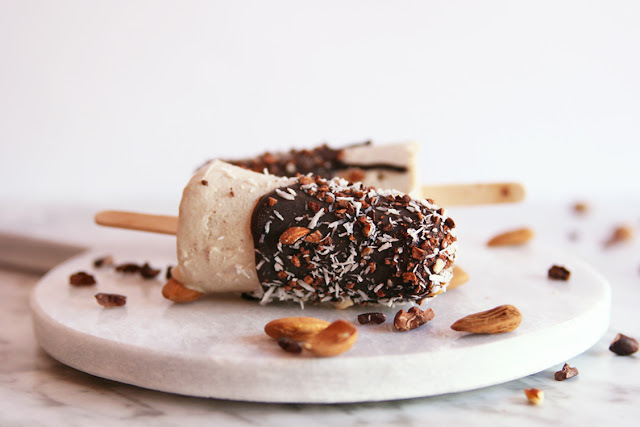 I could eat them every day, perfect for a hot day when you want to treat yourself with something refreshing and sweet but a little more decadent than the regular ice pop. 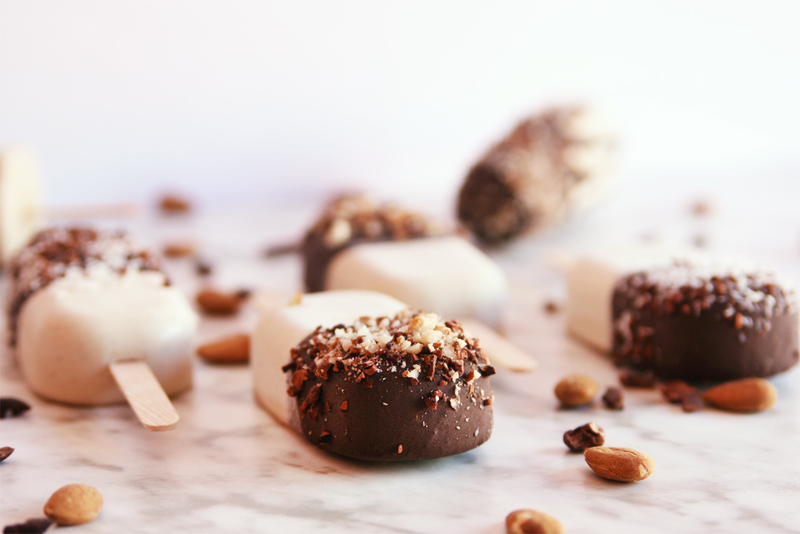 I highly recommend you to try the full combo: pops + chocolate coating + chopped nuts + cacao nibs = summer bliss! 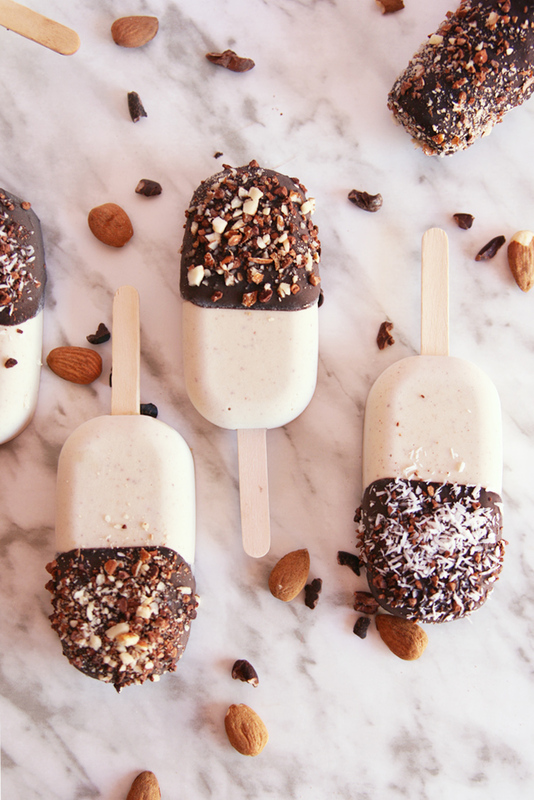 Hope you are all having a wonderful summer filled with outdoor dinners, yummy ice creams and beach fun. 11/2 cups cashews, soaked in water for 2 hours. 1 teaspoon pure vanilla powder. 1 cup full-fat coconut milk. 1/4 cup unrefined coconut oil. Soak the cashews in water for about 2 hours, if your blender is powerful enough you won't need to soak them overnight. Drain them well. Blend together all the ingredients (cashews, vanilla, almond butter, agave syrup and coconut milk) until completely smooth; you might need to stop and scrape down the sides of your blender jug a few times. Pour the mixture into your preferred popsicle molds, insert a wooden stick into each one and transfer to the freezer until solid, at least for 4 hours. In a small saucepan over low heat stir together all the ingredients for the coating until a smooth and glossy chocolate sauce forms. Transfer to a glass and let it cool until it reaches room temperature. 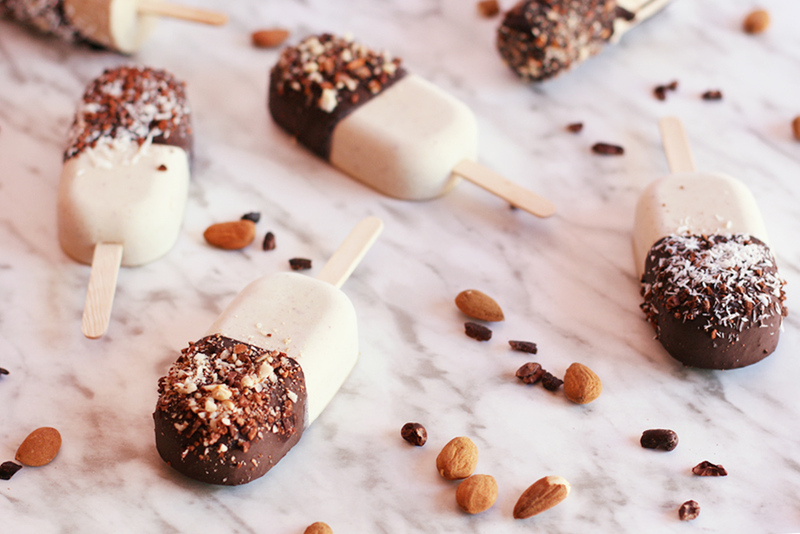 Dip each pop into the chocolate sauce and carefully transfer them to a plate or freezer-safe baking sheet, let them set in the freezer for a couple minutes and repeat the process until all the pops are covered with a second chocolate coat. While the second coat is still soft sprinkle on top chopped almonds, cacao nibs, shredded coconut or whatever you fancy (chocolate shavings, other nuts, etc). Store in the freezer and let them thaw a little bit at room temperature before serving.